This inexpensive console has some real merit. Last week, as I was continuing to learn Android development, I was finally nudged into looking into the new OUYA console. 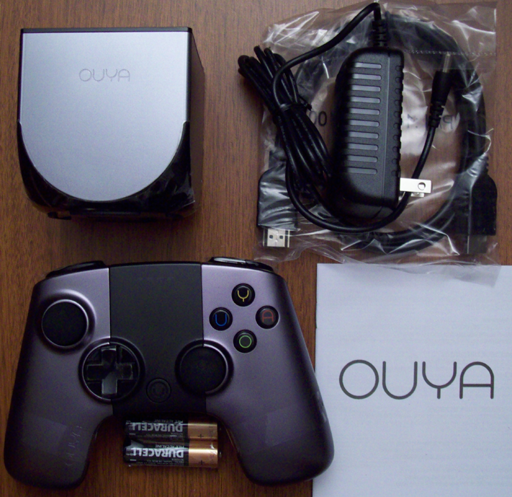 For those unfamiliar, the OUYA is an Android-based gaming console that sells for less than $100. It got its start with a hugely successful Kickstarter campaign and, while it is not intended to compete with the PS4 and XBone launches, it is a legitimate player in the console market. The reason that we considered the OUYA is that it is designed from the outset for open development, which makes it accessible not only for established indie developers like Digital Gamecraft, but also for anybody with an interest and just a little ability, and those who actually produce marketable games can find their titles listed right alongside AAA developers. The unique thing about OUYA games is that all of them are free to try (so it is, in essence, a shareware console). Finally, the time came to set everything up, and I ran into my first issue. Therefore, I will start with the (few) cons that I experienced. The OUYA is a bit short on traditional documentation, so there is nothing explaining how to install the batteries in the console! I challenged our local console expert, and he was unable to figure it out, either. (A Google search reveals that we were hardly unique in our confusion.) Also, after a bit of use, it becomes clear that the OUYA has no ventilation to speak of, so it becomes a rather effective hand warmer in a chilly office, but this will likely be a liability in summer. Returning to the initial complaint, it turns out that the black area in the middle of the controller is a touch pad (! ), which fact I did not discover on my own. On the other hand, there were more important pros. The installation process, including the downloading of a system update right away, was embarrassingly simple, especially when compared to the PS3, as well as humorous (even in the license agreement). The display is extremely clear, even on my poor 720p office/development television. The whole interface is straightforward and easy to understand, and the purchase process is just about as painless as it could possibly be. The controller (contrary to some opinions) is solid and comfortable to use, and, of course, this whole system was inexpensive. The available game software is certainly the most fundamental aspect of a console, and unsurprisingly, this is a bit of a mixed bag, at least in my limited experience (so far). You have top games, such The Cave (currently #1), which delivers everything that one would expect, and others, like Amazing Frog? The Hopping Dead (#3), which seems to have come up a few weeks short of prime time. I really wanted Pinball Arcade to be as good as their attention to detail, but alas, the delay between clicking a controller button and the flipper reaction makes the game totally unplayable. Conversely, and promisingly, the OUYA version of Galaxoid, by lone developer Jacob Davis, is loads of fun (for just a few bucks). This variety makes the ability to try games that much more valuable. The next step is development. Though I spent a little time playing with the OUYA as a consumer would, I have been too busy with paying work to install the ODK (OUYA Development Kit) and build anything for this new console. 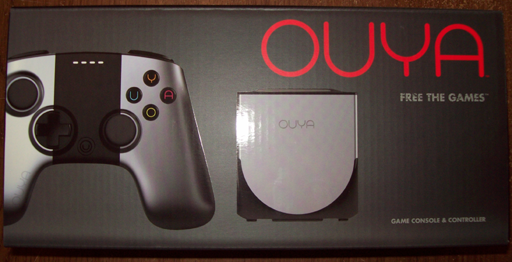 You can be sure that I will post more about the OUYA after that happens. Here are some invaluable tools we used for DemolishPairs.com. With the release of Demolish! Pairs and a number of other projects in the works, it has been a busy time here at Digital Gamecraft. We finally got around to finishing the DemolishPairs.com web site (for now :)). Now, I want to acknowledge three of the tools that proved particularly important to that task. The first tool, and one of the most important in my arsenal, is Beyond Compare by Scooter Software. I have mentioned before (and will probably continue to do so) that this is a product that I use almost daily and it is extraordinarily useful. It performs both excellent file comparisons/”diffs”, showing (in this case) what changes we have made in HTML or code, and fantastic synchronization of files, so we can tell at a glance which files are updated and then copy changes to the servers (usually after verifying the diffs). After using this tool, Dreamweaver is lacking and Expression Web is downright painful, so we exit either tool to publish with Beyond Compare instead. The next tool is 3D Box Shot Pro, by Jellypie Software, which does a lot more than merely box shots. For our iOS app, it generated wonderful 3D images of the screenshots on iPad and iPhone devices, which you can (finally) see on the Demolish! Pairs web page; they really make the page look much better. I especially want to thank Andrew Gibson for actually generating these images (and more) and opening my eyes to the benefits of this software. Here is more information and a short video showing how to make a 3D iPhone (or iPad) model with 3D Box Shot Pro. The final tool is CSE HTML Validator by AI Internet Solutions. This software validates your web site by checking your HTML (and CSS, etc.) files for issues that either will or could cause problems, and helps to make your site better all-around. (It is like PC-lint for web sites: essential.) Having used all of the validations in Expression Web successfully, I foolishly assumed that everything was fine with the site, but Dexter Bell (developer of FileBoss) pointed out that I had made a fundamental error with my HTML/CSS. The tools from Adobe and Microsoft let it slide, but HTML Validator flagged it right away. You can get an idea how thorough the product is with an online validation (but if you check mine, you may see that the iTunes link Apple provided me is invalid 🙁 ). If you are developing a web site, I strongly encourage you to check out all three of these tools to help make your job easier, better looking, and more robust. Spam, spam, go away… You are not welcome ANY day. My approach to my primary email address, from the very start (more than 13.5 years ago) was that potential clients and customers should be able to contact me without jumping through hoops, so I have never bothered to hide or obscure my address: seelhoff@sophsoft.com . I have always published it in plain view (and to do otherwise would now be closing the barn door long after the horse has bolted and gone on to live free and happy until dying of old age). Of course, this also allows any spamming slimebag with an address harvester to easily add me to each and every email database on the planet, so I do get spam. Lots of spam. To be honest, though, the level of spam to my “open” account seemed to plateau fairly quickly, although I never really kept track. Over the years, it may have been slowly and steadily rising, but I know that my patience has been slowly and steadily declining, so a while ago, I added some tools to stem the tide. Let’s talk numbers, first. Since the beginning of April, my primary email account has received 75,000 email messages. Of those, almost exactly 98% are spam. Of the other (legitimate) messages, 80% are business (1.6% of the total), and the remaining 20% (0.4% of the total) are personal. Both of these categories include active mailing lists, such as Carbon and DirectX development (business) and community events (personal). I set up my email client to automatically sort these (and marketing messages) into appropriate folders, and the number of messages specifically to me, from clients, customers, family, and friends, is just a handful per day. These are the only ones that actually hit my inbox and trigger a notification sound. To be honest, not all Bayesian filtering is created equal, and my email client is probably about average. It handled much of the junk, but an annoying number of spams were being missed, and signalling me (incorrectly) that I had a legitimate message. When I finally had enough, I downloaded and installed POPFile upon a recommendation from somebody in the ASP. I had been leery about installing an interim mail server on my system simply for filtering email, but it turned out to be an excellent choice. After several months of training, POPFile is 99.92% accurate selecting among business, personal, and spam classifications and, importantly, I have gone for more than a month without a false positive for spam. (Most of the classification “errors” are simply unclassified messages that need to be trained.) Used in series with my email client, I can review messages that either think may be legitimate (ideally, to never miss a valid email), but I am only notified of incoming mail if they both agree on the validity. This has greatly reduced interruptions and made my days more productive. Of course, there is some training involved so POPFile can “learn” the difference between legitimate messages and spam, but the initial process goes pretty quickly (and when one averages more than 1000 messages per day, there is lots of data). If I were to start all over again, I would not have chosen to have business and personal messages separated, since that distinction is not particularly necessary for me (and not always clear, either, such as when a family member reports a server problem, or a business associate invites me to a party). If you are looking for an anti-spam solution local to your own system, I strongly recommend POPFile.